Working in sc not dc's, rpt last round once. Fasten off. Working in sc not ch's, rpt last round once. Fasten off. Finishing - Weave in and trim all loose ends of yarn, decorate with buttons over sl st seam. 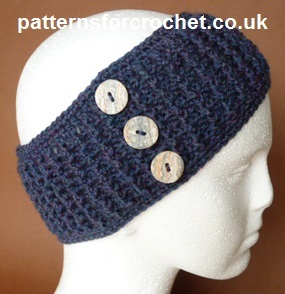 Hope you enjoy this free crochet pattern for headband earwarmer.